Last night was Week 8 in my class and I'm still delighted that I decided to take it. Readers of this blog may remember that it is my first art class since 10th grade in high school, so I had a little trepidation. I've enjoyed these years teaching myself and wasn't sure whether I wanted any formal education in Art. 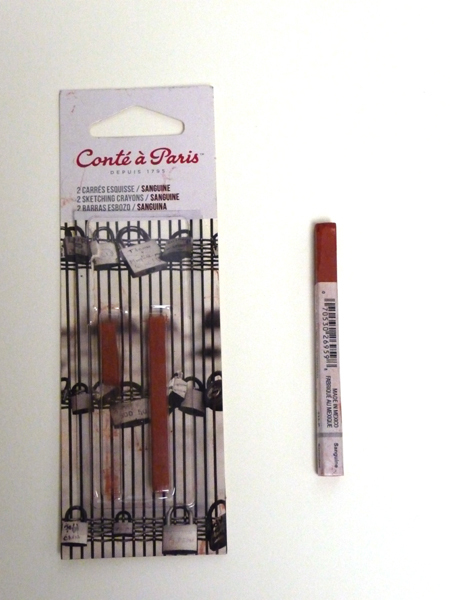 Last week and this week we worked with Conte Sanguine chalks. I've never drawn with anything but a pencil or pen - so it took me a little while to even get comfortable with the medium. Here are the two chalks that I bought for the class. All images are from photos on 18 X 24" paper. It was different to draw without a point on the chalk. This model was drawn with the Conte chalk on the left. And then after, drawing the figure, I had no idea how to shade it. This was the 20 minute pose from last week. Last night I used the Nupastel Sanguine on the right to see if I also liked using it. I didn't realize the difference in color until I photographed both this morning. 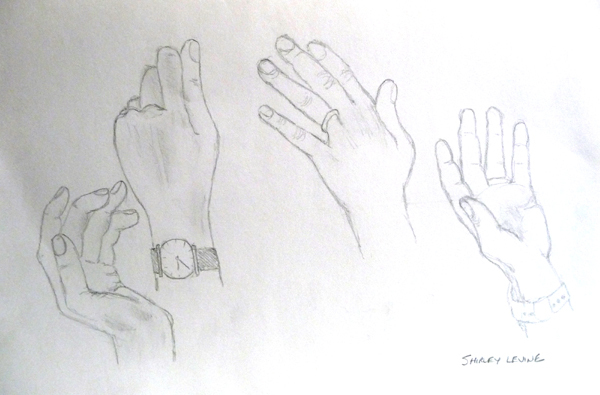 These are 2 of my 4 Five Minute warm up sketches. We spent the rest of our time sketching the model in just one pose. That was torture for me. I draw quickly and become bored easily - so I found myself fiddling. I had to turn the drawing in after class to be graded, but will post it when I get it back. My self-portrait ( posted previously)received an A! There are so many wonderful new exhibits in NYC that we are going to see at least one every Wednesday morning for the next few months. 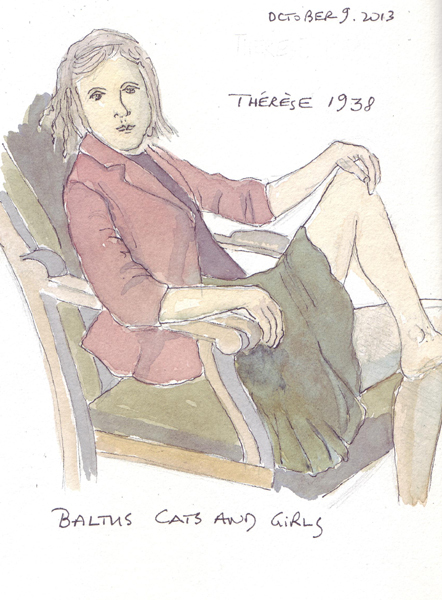 Last week we went to see Balthus Girls and Cats at the Met. My Figure Drawing Professor encouraged everyone in our class to see it because of the importance of Balthus as a 20th C. figure painter. 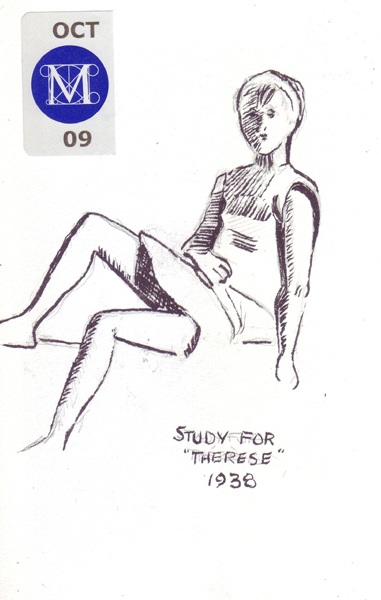 I sketched Therese, his 16 year old model in pencil, and then painted her at home. The next sketch was from the show catalogue and was fun for a quick sketch in pen. 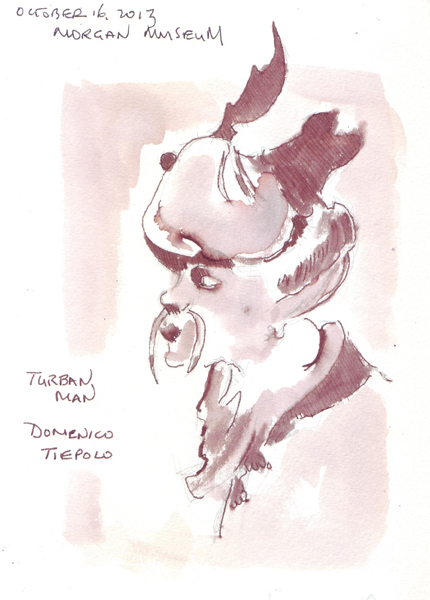 This week we went to the Morgan to see Tiepolo, Guardi, and Their World: 18th C. Venetian Drawings. Their lines were so wonderful! I just wish that I had a single pen to draw such a variety of lively lines. I used a brown Tombow marker for this drawing and the ink wash. I did the drawing with 9B graphite and white charcoal pencils. I love watching the sea gulls during our beach walks, and take lots of photos to document their size, coloration, and movements during take-off and landing. 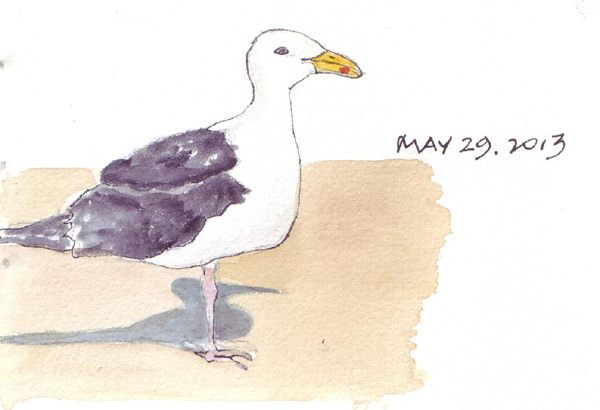 This sea gull was drawn on the first page of my summer beach sketchbook. Wish I knew why some birds have that red spot on their beak. 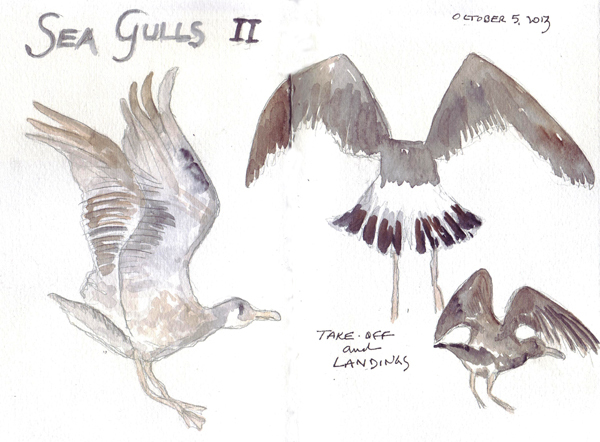 These are gulls photographed during our last visit to the beach for this year, and all were drawn and painted from photos that I took during takeoff and landing. I love to watch them run on the sand for a few feet before lifting off - and then gliding in after one big circular path over the surf. 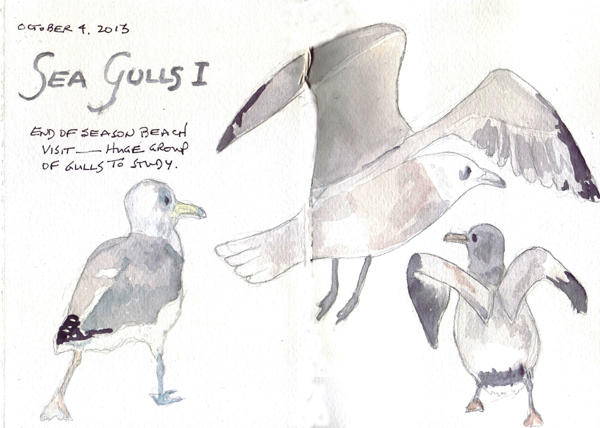 Good bye sea gulls until next summer! Last night was my 6th figure drawing I class at FIT. I was very apprehensive about taking a class, but I'm really enjoying the structure and challenges. We spent the first 3 weeks doing contour drawings of models - with anatomical review and examples of figures drawn by Egon Schiele, Gustav Klimt. I've posted some of those drawings in the last month. In classes 4-6 we began shading. 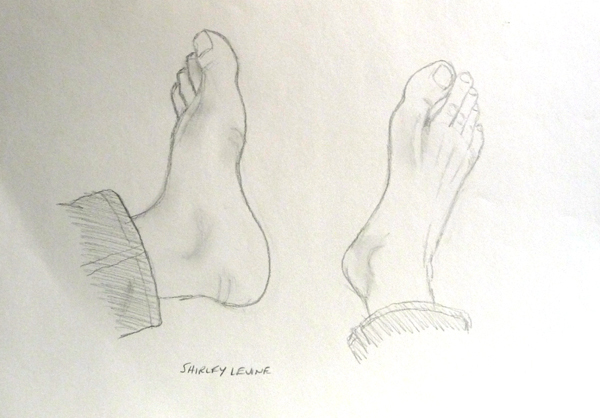 My two drawings of the young female model from Class 4 were also posted previously. 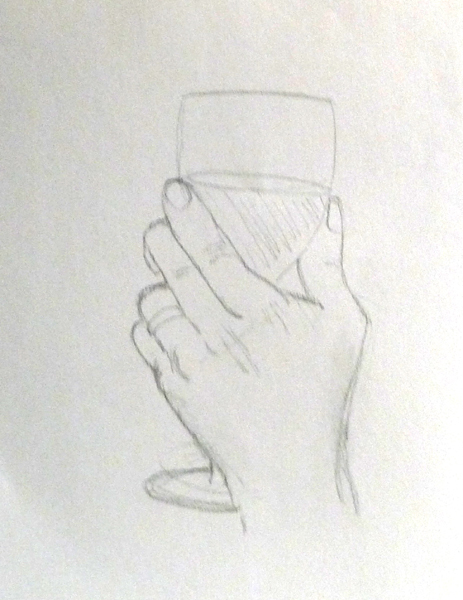 At the end of the 4th class our homework was to draw 5 hands (with #5 holding something) and 2 feet. As much as I was enjoying taking this class for fun, I was also thrilled with my grade of A on this assignment! These are my husband's hands and my feet. In Class 5 we did a portrait on toned paper (which was handed in at the end of the class). 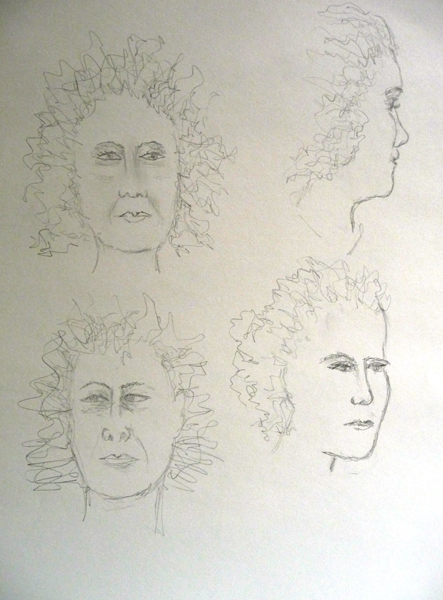 But I do have the warm up exercise in which the model changed head direction every 5 minutes. We looked at Holbein portraits as wonderful examples. Last night was my 6th class, and we continued shading - reviewing the beautiful drawings of Kathe Kollwitz and Peter Paul Rubens. This is one of the long poses (20 min) that I did. I'm still using a 9B graphite pencil on 18 X 24" paper and only flirting with charcoal in a few fast sketches. Still hate the mess!! 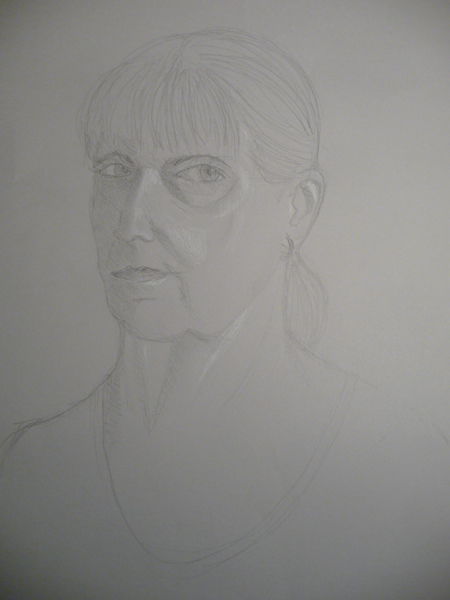 Our homework assignment for next week is a self-portrait on 18 x 24" gray-toned paper. Yikes!